Looking back at 2014, I feel personally that it was not a good rowing year. With ‘rowing’ I don’t mean bad outings in my little dinghy; as a matter of fact I had no outings at all on the Mystic River during 2014, which in itself is not particularly good. Instead, however, I am thinking of other ‘rowing related’ matters. The last load of rowing stuff leaving the G.W. Blunt White building. 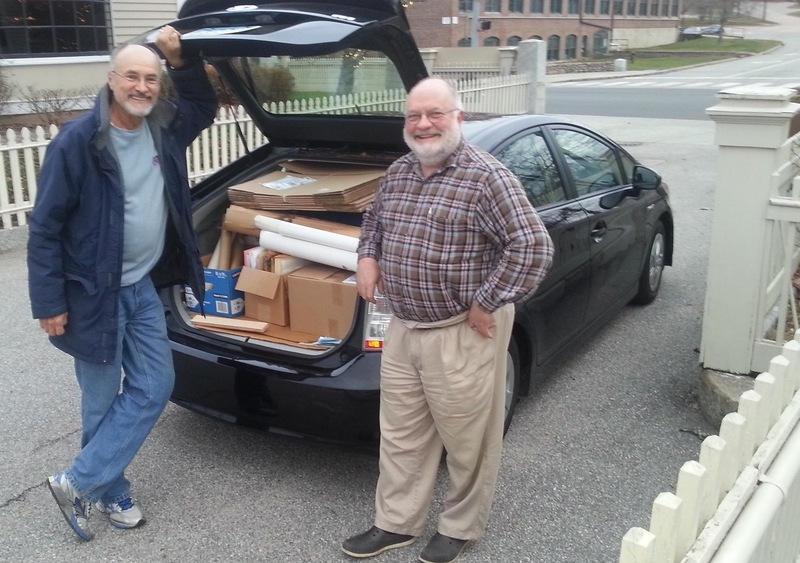 Rowing historian Tom Weil (on the right) and Dave Vogel, former heavyweight rowing coach at Yale, have packed Tom’s little car for further transport to a warehouse. I have already dwelled a lot about the closing of the NRF’s National Rowing Hall of Fame and the connected rowing exhibit “Let Her Run” at Mystic Seaport, which really is a shame. The G. W. Blunt White building, where the ‘Hall’ was located, is going to be demolished in the beginning of January, and the rowing memorabilia is now packed and shipped off to a warehouse to be stored till a new location has been found, which will take some time. Then, it was with sadness I was reached by the news in mid-autumn that the Swedish Rowing Association had decided to cease publishing its rowing magazine, Svensk Rodd, a publication that my friend Per Ekström and I founded in 1990. Per and I worked together with the magazine until 2000, when I moved to Connecticut. Per took care of the editorship on his own after that, with me as a contributing editor over the pond. But with a shaky economical budget, the Swedish Rowing Association decided to kill the publication in its twenty-fifth-year. Very sad, indeed….. There are now not many printed rowing magazines left. If I understand it right, the Dutch Rowing Association’s publication Roeien, founded already in 1939, ceased to exist a year ago. [Update: rowing historian Chris Dodd reports that there is, as a matter of fact, now a new Dutch rowing magazine, Roeiblad.] These days there are fewer than a handful rowing magazines being published, either by a country’s rowing federation or independently by a media group. British Rowing’s Rowing & Regatta is now coming out eight times a year, after having published nine issues each year 2011 and 2012, Wendy Kewley, editor of R&R, reports in an e-mail. In November, the independent Rowing News, which has been around for two decades, but during the last years seeing the amount of its subscribers diminish, partnered with USRowing, so that the members of the rowing governing body in America would get Rowing News for free. A good deal for both partners, I guess. However, with a newly published printed rowing magazine, the fine-looking ROW360 coming out this past summer with circulations both in the U.K and in the USA, it’s easy to understand Rowing News’s concern that it would lose shares on an already shrinking market, and therefore something had to be done. ROW360 is truly a beautiful publication with a great variety of topics in each issue. For those of us who have been around the rowing magazine world for some time, ROW360 reminds us of the German rowing magazine Rudern, which was an equally fabulously published independent publication, which put the German Rowing Association’s Rudersport to shame in the 1990s. But what happened to so many other, non-rowing, fancy-looking publications, it was too fancy and expensive and after a few years Rudern went down the drain – what a pity. 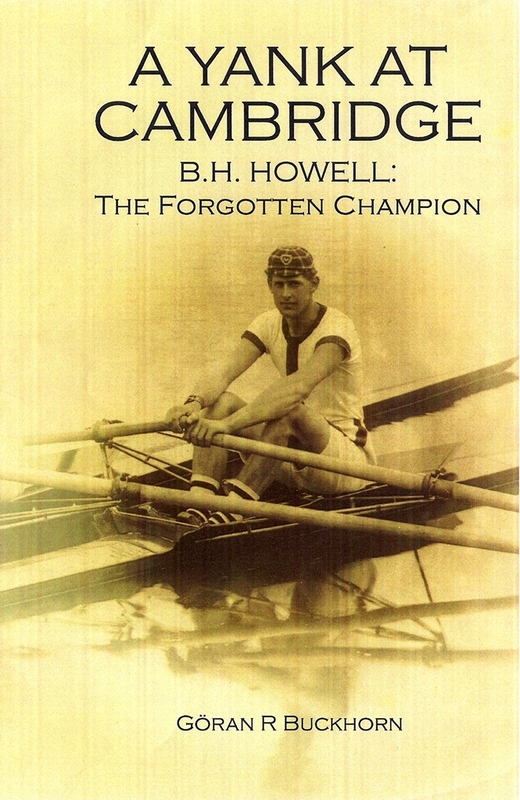 Talking about publications and disappointments during 2014, I had good hopes that my little book about Benjamin Hunting Howell, an American who successfully rowed and sculled for Trinity Hall, Cambridge University, between 1894 and 1898, and then for Thames RC between 1898 and 1900, should hit a selected amount of book shops during the autumn of 2014, but it did not occur due to ‘technical problems’. Instead, I am aiming for a release in the beginning of next year. Please, keep your fingers crossed. The really big blow, making this a crabby year to say the least, is that my old rowing coach Tore Persson (first name pronounced “Torr-eh”), at Malmö Roddklubb, the rowing club in my old home town Malmö in Sweden, died, at the age of eighty-four on 18 July. 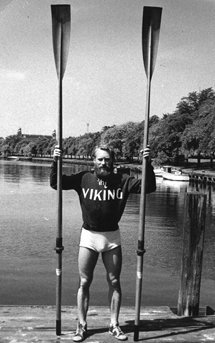 When my friends and I began rowing at Malmö Roddklubb in the 1970s, Tore was the all-mighty coach, who more or less ran the club, which almost had ceased to be in the 1960s. During the last half of the 1950s, Tore had been the club’s star sculler, and had taken several Swedish Championships in the single sculls and double sculls, and had represented Sweden in the Nordic Championships. In the beginning, we young boys never understood how big Tore had been in Nordic rowing. It would, however, be obvious when we went to compete in Copenhagen on Bagsværd Sø in Denmark. The otherwise high and mighty – and for the rowers often unseen – regatta committee with its chairman would leave their tower to come down, dressed in their rowing blazers and white trousers, to shake Tore’s hand and to ask if there was anything they could do for Tore and for us rowers from Malmö. In mid-May 1957, one hundred twenty-five top Nordic oarsmen, including Tore Persson, gathered in Norway as extras, rowing two replicas of Viking ships in the Hollywood movie The Vikings, staring Kirk Douglas and Tony Curtis. Tore would keep his long beard after the movie was done. Tore is here seen at Malmö Roddklubb in 1957. In his ‘civilian life’, Tore worked on the production line at a large newspaper in Malmö, but he could equally have worked as a journalist at the paper. When Per Ekström and I started Svensk Rodd in 1990, Tore would write articles for the magazine that were well-written, witty and extremely funny, even those which went hard at the Swedish Rowing Association criticising their work. His pen could be sharp, and he would use it, never to ‘kill’ an opponent with a nice and clean poke with a foil, no, he would instead cut someone along their ankles with a sabre – no mercy! After I had moved to Connecticut, Tore and I were still in contact. Witty letters would arrive, and sometimes, a couple of times a year, I would call him, especially after his wife had died. I always made a point to meet him at the club when I was visiting Malmö. Now he is gone and I will miss him tremendously. No, 2014 was not a good rowing year…. 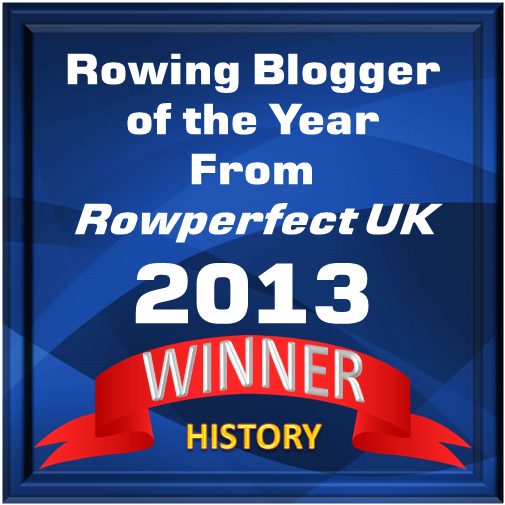 Thank you for your splendid rowing blog! I enjoy it very much. Until now I never posted a reaction, but I permit myself a comment on ‘2014 – Not a Good Rowing Year!’, and the good news is (as shows the update with Chris Dodd’s report): the appearance of a new Dutch rowing magazine called ‘Roei!’ after the cease of ‘Roeien’, one time the official periodical of the Dutch Rowing Association. ‘Roei!’ is a very informative, independent magazine with a beautifull layout about all aspects of rowing: racing, touring, training, technics, etc. We do hope it holds on for a long time. See the blogspot http://roeiblad.blogspot.ch/ and the website http://www.roeiblad.nl/ . Much rowing pleasure in 2015! HTBS follower and member of the rowingclub in Hengelo, Netherlands (http://www.trvtubantia.nl/ ). Thank you, Eltjo for your comment and for your kind words about HTBS, much appreciated. Yes, indeed, it is good news that you have a new Dutch rowing magazine after ‘Roien’ ceased to exist. I wish ‘Roie’ all success.